The term alludes to the Russian practice of punishing prisoners by sending them to work in the salt mines of Siberia.But it's strange.. I couldn't find any other info except for this little tidbit! I can find the idioms meaning but not the history of it! I'll keep on searching:) Mme. Reed reporting for duty! The weather in Boston looks so mild. She's a tough gal for reading outside in winter! She 's completely lost in the pages of her book..She seems to be so far away! it must be a very good book..The picture is so peaceful! Very interesting photo with this shadows, and book must be really unputdownable! Knowledge is the best food for the soul! Great composition. I suspect it will be a few months before there is much lunch time reading outside in Boston. I like the horizontal and vertical lines and where you have placed the reader in the shot. Very pleasing to the eye all round. 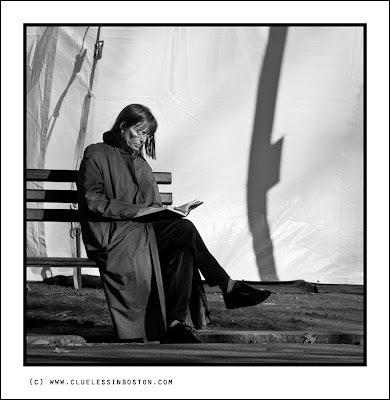 I love the way the shadows behind her echo the curve of her back as she bends toward her book. This is an excellent study in b&w. A not 'uncommon' sight in the city. If you're coming through Brattleboro let me know. I not fond of B&W so, when I see one I like, my compliments are absolutely sincere. This is a fine portrait and very good as is. Very nice lightened and composed - I always like your b/w urban shots very much. The shadow in the background is great as an eyecatcher. Soaking up the sun, but it still looks cold. Nice shadows! Just and awesome photo..the shadows on what I assume is a tent add a sort of structure here. I love this lady's face...professorial I think. I am so glad I found your blog. I grew up in RI and spent as much time in Boston as I did in Providence. These past six years, I've become a Floridian, but my heart will always be in New England. It's such fun to see your photos and know exactly where you are. Another wonderful photo - your people shots are just terrific. I do like this shot! Composition, lines,light and shadow are very good.